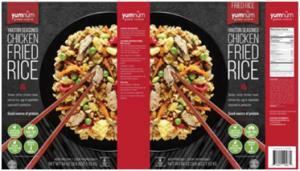 Harvest Food Group is recalling 23 tons of not-ready-to-eat chicken-fried rice products. According to the Food Safety and Inspection Service, the products contained milk that was not disclosed on the label. The company voluntary recalled product when the error was recognized. There have been no reported cases of adverse reaction from consuming products processed on November 12th and on December 4th and 5th from establishment P-34457.